In other words, investors want to know why they’ve been holding onto assets that have traded in a very tight range for quite a few years and haven’t appreciated meaningfully during that period. Fair question. But, we’d argue that watching the game clock is not what owning gold is about. Think of gold and silver ownership as more like an insurance policy than, say, a hot stock tip. When insurance policies aren’t doing the one thing they do best, they can be downright boring. And, if you pay undue attention to them, you can easily overthink your strategy, trying to time events and costs. As a gold and silver owner, you often need to maintain patience over the span of many years — sometimes a difficult task. If you want to speculate on short-term gold prices, you might consider a more leveraged vehicle like futures. But for the truly long-term investor who understands gold’s role in a portfolio, that patience is invariably rewarded. Gold’s proven time and again that once disastrous events occur, it will do the job you bought it for: protect you from market crisis. Still, the question stands: When? We don’t like to predict the timing of markets. It’s a fool’s game, frankly. But there is a difference between declaring something imminent vs. simply inevitable. 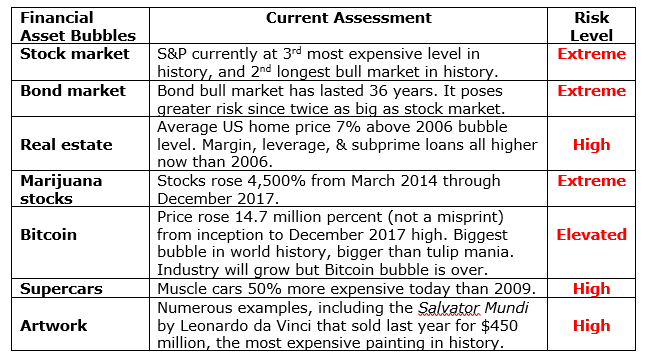 On the latter point, of the factors that might ignite the next bull market, there are numerous potential catalysts we see today. And they’re the reason we’re overweight physical metal. Check out the number of crises that have occurred since the world severed its tie to gold in 1971. See if you can spot the pattern. The pattern is this: there have been 24 major financial crises in 45 years, an average of one every two years.And this list isn’t even exhaustive. You’ll also notice that since the financial crisis 10 years ago, the US has had no major financial event. But the US has not become magically immune from financial crisis; the Fed has simply delayed the inevitable with ZIRP and QE. The events on this list had varying impacts on the gold price — some big, some small — but playing with fire eventually gets you burned. Either way, it is inevitable that more crises will be added to this list. What will those events be? As I started to add up all the risks in the financial system—any of which can serve as catalysts for gold and silver—I realized there were so many that I needed to categorize them and put them into tables. And they needed a risk quotient, too. Seeing them visually makes our situation very clear to me; see what you think. First up, market and investment bubbles. We could say a lot about the Everything Bubble, but you can see that most every major asset class is in a bubble (or has already started to deflate). This setup has occurred only rarely throughout history, and the risk is that they could all deflate simultaneously. There will be nowhere to run for investors — except to the safe havens of gold and silver. The level of virtually every category of US debt and credit are at all-time highs. And this isn’t even a complete list—it excludes other countries that carry even higher debt loads. Clearly, the risk of a major event related to debt levels is high. And even if we don’t have a debt event the options available to central bankers and politicians to fight off a crisis will be extremely limited. The fallout could be ugly. I feel a whole lot better owning physical gold and silver under these circumstances. 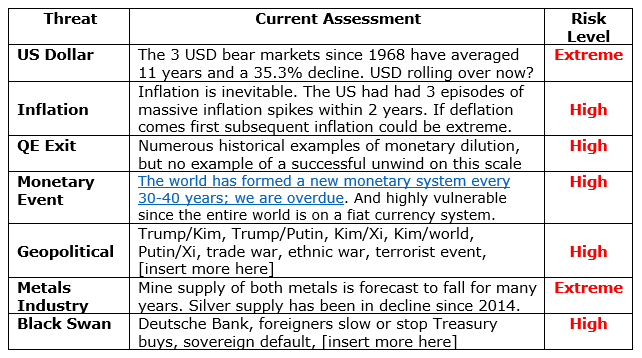 There are a number of very real and present dangers in the world today, any one of which could ignite the precious metals markets. The reality is that several of these threats, at least, will likely materialize. When you get a birds-eye view of all the risks present today, do you really want to be without a meaningful holding of physical gold and silver? My reaction to these tables was to question if I had enough metal. The worry about the price lag melts away when you soberly consider our nation’s financial situation today. Don’t let soft prices keep you from protecting and potentially profiting from one of most financially precarious times in history. So when do gold and silver take off? The answer is straightforward: when one or more of the above events materializes. Gold is inversely correlated to stocks and currencies and economic growth, so when those inevitably reverse as they always eventually do, precious metals are likely to begin their next major ascent. Keep in mind that September is typically gold’s best month of the year. If things start to go south in the economy or markets at the same time, you’ll want to have all the bullion you need by August. Either way, I keep accumulating. I bought a nice stash of these a couple weeks ago—one of highest-grade bullion coins you can get, along with the industry’s most advanced security measures. A very pretty coin, and at low premiums to boot.